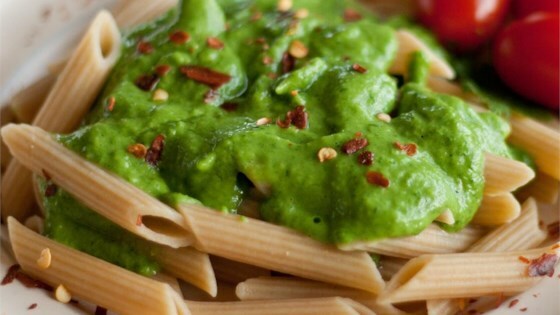 "Avocado and cilantro lighten the spicy arugula making this an easy go-to sauce for pasta or a spread on sandwiches." Place arugula, cilantro, avocado, lime juice, and garlic in a blender; pulse until combined. Add water as needed to thin sauce. Season with salt and pepper. See how to make a rich, creamy Alfredo sauce for pasta and chicken dishes. Servings really depend on what you are using the sauce for. On pasta I find that it gives me 3 well-sauced pasta bowls. When I use this as a pasta sauce I also toss in bits of asparagus, artichokes and tomatoes. Dairy Eaters - Add 1/8 cup Parmesan cheese. Meat Eaters - This goes really well served with flank steak.